I’m personally excited for both of these Kill Team expansions. 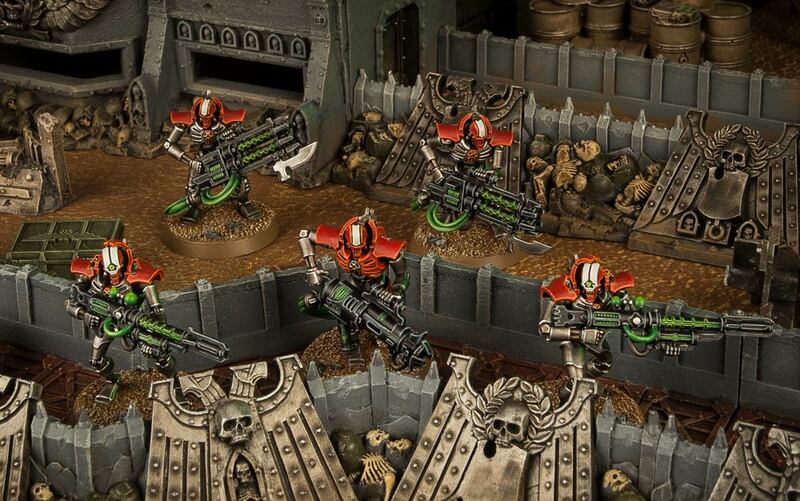 They add new strategy and depth to the Necrons–who have a fairly bland, if effective, Kill Team core–as well as the T’au who might have trouble leveraging their firepower in games of Kill Team where you’re routinely expected to be at -1 or 2 to hit. 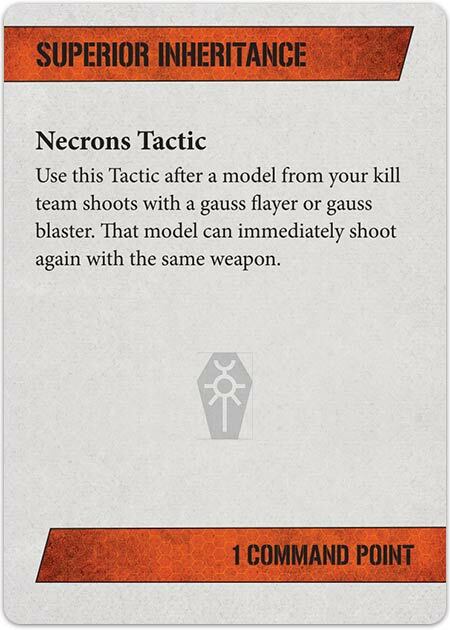 Both the T’au and Necron use advanced technology to take down their foes, so whether you’re a fan of ancient relics or newfangled machines, there’s something for you in the next two Kill Team Expansions. 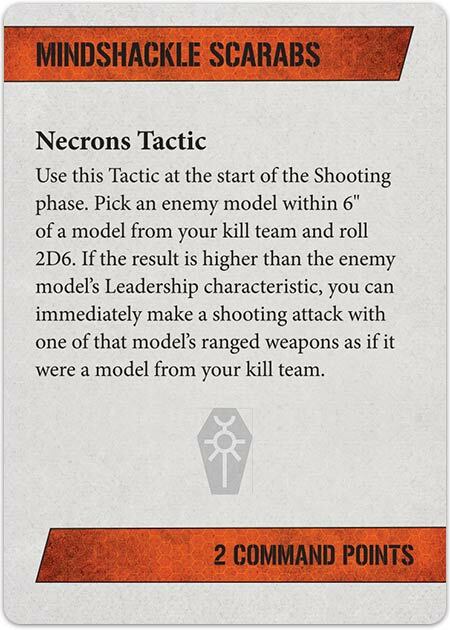 We’ll start with the Necrons, since we know they came before even the chicken and the egg. The Necrons are an elite and incredibly hardy faction, and though their kill teams will often find themselves outnumbered, they are more than capable of overcoming the odds. First and foremost, their combination of high Toughness and solid armour ensures that they are not easily harmed in the first place, but they can even recover from injuries and flesh wounds thanks to Reanimation Protocols. This is both a blessing and a curse. Unlike 40K, you don’t get to keep checking as the turns roll around. 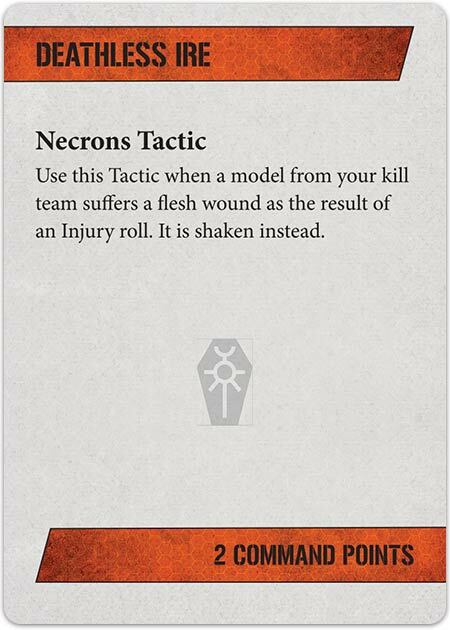 It’s a bit like an extra Feel No Pain, only your opponent rolls–but it does take the wind out of their sails when they roll a 6 and you wipe the slate clean of any flesh wounds you have suffered. Especially when combined with some of the Necron Tactics out there (with some exclusive ones available in the Kill Team starter set), you’ll find a lot to look forward to for these undead robots. 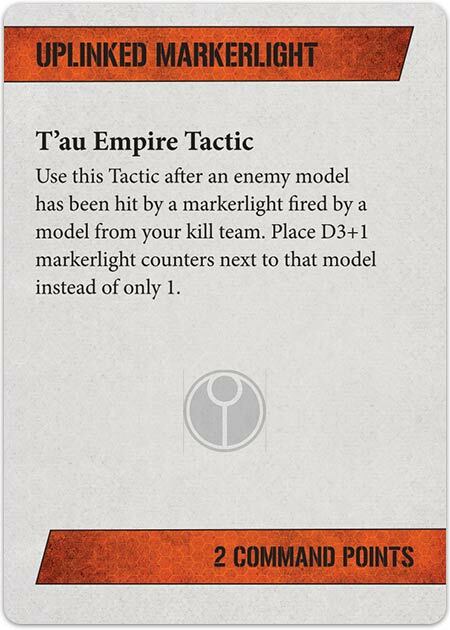 So you can shoot twice, take control of an enemy model and have them shoot and keep your models fresh when a flesh wound gets applied to them. Resilient and shooty, the Necrons make for a deadly kill team. 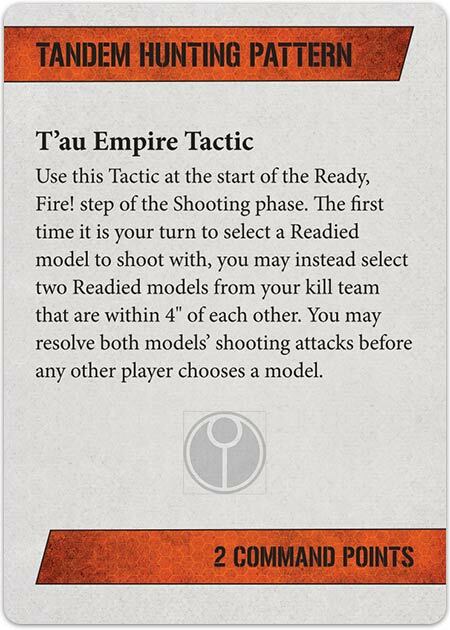 Meanwhile over in the T’au Empire, we see the forces of Advance Team Starpulse. 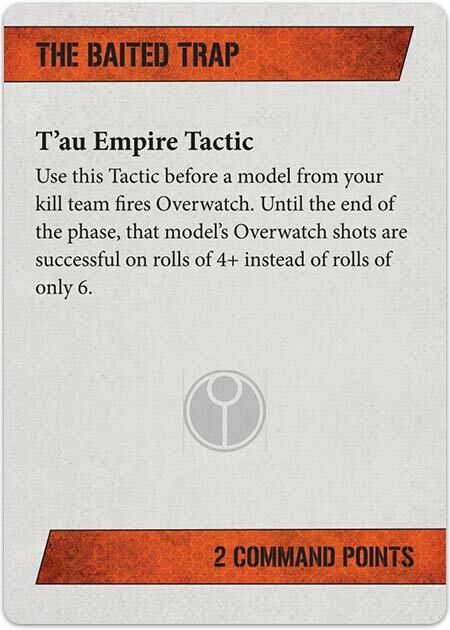 But they add to that a few other tactical tricks (including a few we’ll see hidden in the Starter Box) which give them some surprise options. Tandem Hunting is probably the best one of the bunch, as it enables you to pick two of your models and shoot them, letting you get the drop on an enemy with your devastating firepower. Now you likely will miss both shots, so prepare for that now, but, in theory it’s a lovely ability. The Baited Trap is also quite nice on a Stealth Suit, giving them four 4+ shots to try and stop a charging close combat model. The nice thing about that on a Stealth Suit is that even if you don’t kill your target, you can still get out of combat and be effective (assuming you survive) thanks to the Stealth Suit’s jump jets (and fly keyword). Both of these sets should be up for pre-order this weekend, so brace yourselves friends. 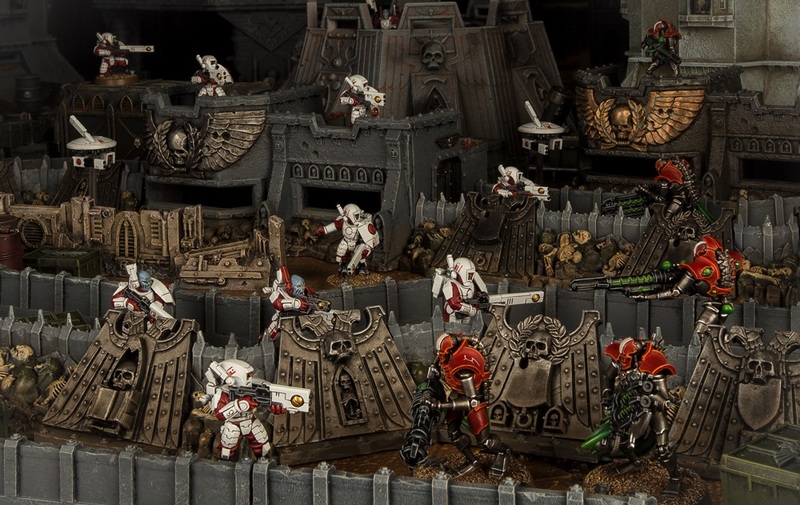 Plus with each of these you’ll get the Wall of Martyrs Kill Zone, giving you some entrenched positions to battle over. What do you think of these two new teams?